1 I was brand ambassador for Pacari Chocolate at the Food & Wine Festival in exchange for a reduced conference ticket price. Thank you. I was brand ambassador for Pacari Chocolate at the Food & Wine Festival in exchange for a reduced conference ticket price. Thank you. As many of you may know, I attended this year’s Food & Wine Conference in Orlando, FL a few weeks ago. I had applied to be a brand ambassador, and aside from helping to promote the conference itself, I was also assigned Pacari Chocolate as my brand. I arrived at Rosen Shingle Creek on Thursday night and emailed my Pacari contact, Francisco, to see if he would have time to meet before the conference started so I could learn more about Pacari. I was able to meet Francisco and his wife Ana for a late breakfast on Friday morning, and we ended up talking for an hour and a half. I came away from our breakfast not only 100% impressed with Pacari chocolate as a product but also with Pacari as a business. 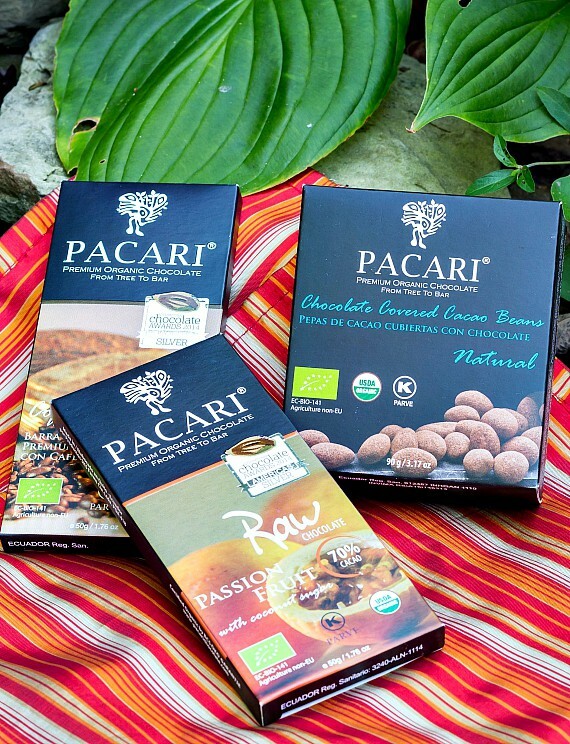 All Pacari chocolate is organic and vegan. It is also nut-free (although the packaging must say there is a risk for liability issues). 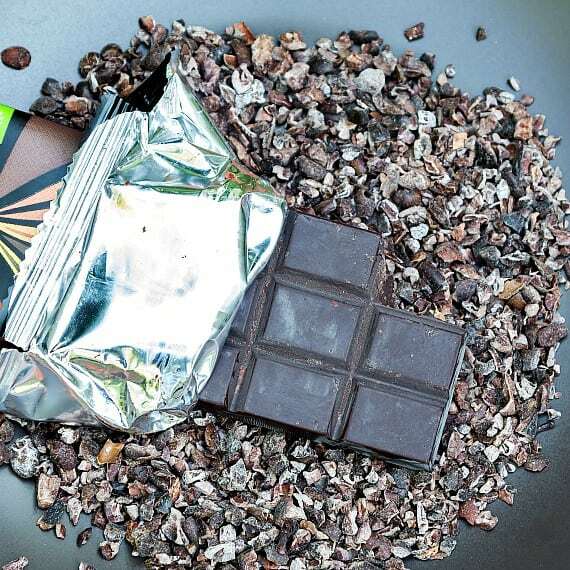 They also have a line of raw chocolate including cacao powder (hello, superfood! ), nibs, chocolate drops (chips) and bars. Pacari makes sure to source as many ingredients locally as possible. And for Pacari, local means Ecuador. Their chocolate bars come in such sophisticated flavors as lemongrass (perfectly balanced), Andean mint (unlike any mint chocolate you have ever tried before, I guarantee), Andean Rose Geranium (indescribably perfect), Passion Fruit (which smells so incredible I want The Beloved to wear it as cologne) and my personal favorite, Raw Chocolate with Andean Salt and ground Cocoa Nibs. The sensation as this chocolate melts on the tongue is hard to describe. The slight crunch of the nibs, the creamy, mellow chocolate and the spark of the occasional salt crystal combine in what is probably the best bite of chocolate I’ve ever had. Santiago and Carla realized that none of the cacao farmers that they spoke to had ever eaten a finished chocolate bar. While they may have known that the beans they harvested and exported wound up in “candy,” they had never tasted chocolate themselves. Francisco said that was one of the main reasons Pacari got started, to keep the farmers involved every step of the way. 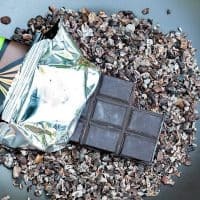 As a thank you to Francisco, Ana and Pacari, I wanted to create a recipe that stays true to the raw/organic/vegan DNA of the Pacari cacao powder, nibs and chocolate drops they gave me, so I decided to go with a no-bake, mostly raw granola bar. I even made a video to show you how to make them. Vegan/quasi-raw was completely new territory for me, so I did some searching and found a simple recipe for Five Minute, No-Bake Vegan Granola Bars. I also looked at The Minimalist Baker’s Healthy Brownie Granola Bars. 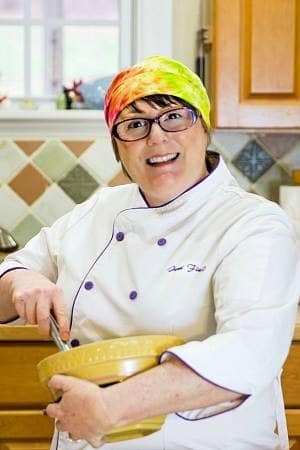 For those who are interested, I was looking for proportions of “gluey” ingredients to “main ingredients.” Once I got a handle on that, it was on, and I even finally got to use the very cool date syrup that my friend Stacy from Food Lust People Love sent me all the way from Dubai. Thank you, Stacy! I think the bars I’ve come up with are the best (mostly) raw no-bake vegan granola bars I’ve ever had. Okay, they’re the only (mostly) raw no-bake vegan granola bars I’ve ever had, but still. They’re pretty delicious, and this is coming from a girl who loves her baked goods, her refined sugar and her butter. And now, without further ado, I give you No-Bake Vegan Chocolate Chocolate Chip Granola Bars featuring Pacari Chocolate Raw Cacao Powder, Raw Cacao Nibs and Raw 70% Chocolate Drops. Enjoy! 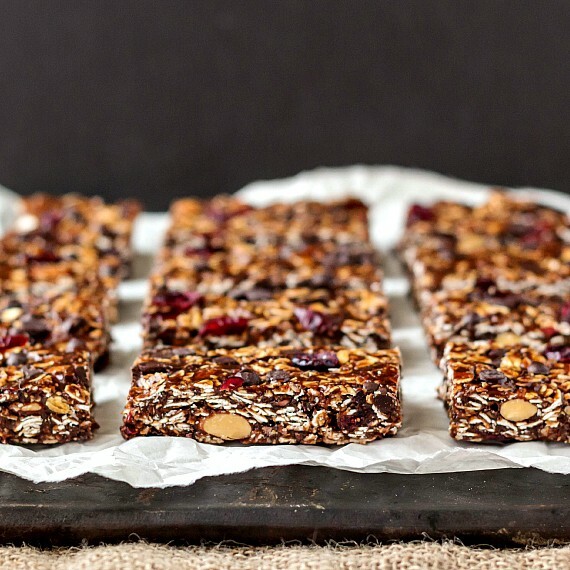 These rich, chocolaty no-bake granola bars are packed with nutrients from raw cacao powder, cacao nibs and raw chocolate chips. Studded with roasted almonds and dried cranberries, they are filling, delicious and good for you. 2 1/2 cups rolled oats, , toast them in the oven or not. It's up to you. Prepare an 8"x8" or 9"x9" pan by lining the bottom and up two opposite sides with non-stick foil or parchment paper. Set aside. Thoroughly stir together the maple syrup, date syrup, almond butter, coconut oil (if using), vanilla and salt. Scrape the cacao mixture into the bowl with the oats and almonds. Fold together thoroughly until all the oats and almonds are well-coated. Press the stiff dough evenly into the prepared pan. Evenly sprinkle on the chocolate drops, dried cranberries and salt. Press down gently so they adhere. Press plastic wrap down on the surface of your granola and refrigerate until thoroughly chilled, about 2 hours. Slice into bars of your desired size. Store in the refrigerator for 5-7 days or freeze for longer storage. If you have never had raw granola bars before, note that they are chewy and just a little bit sticky. And delicious. 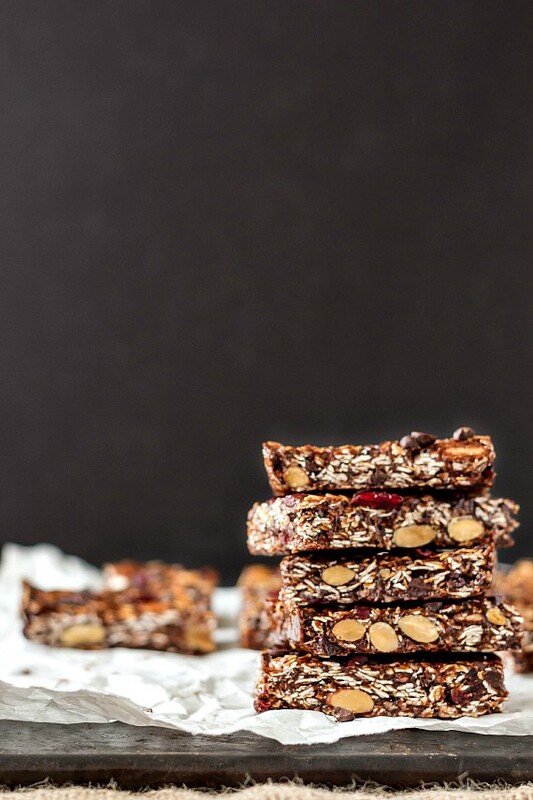 Do give these no-bake vegan chocolate chocolate chip granola bars a try. They are seriously good and really easy to make. They’re also perfect for making in the summer since you don’t have to bake them. Nice! Thanks once again to Francisco and Ana of Pacari Chocolate. It was a pleasure and an honor to represent such fantastic chocolate and such a great company at the Food and Wine Conference. And thank you guys for spending some time with me today. Have a lovely day. I HAD to eat a Pacari Aji (chilli peppers and spices) bar while reading this fabulous post. Pacari hit the lottery when you were assigned as their Brand Ambassador at the Food and Wine Conference. The chocolates are as divine as you describe and I love how creative you got here. Not surprised in the least! 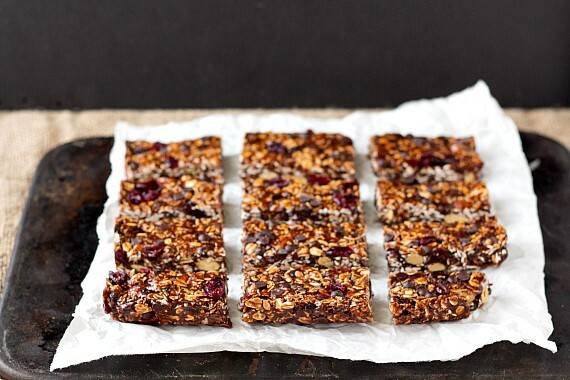 Healthy energy bars – I’m in! Bookmarked the recipe as we’re all about no bake desserts atm – it’s too hot to turn the oven on. True–it is so hot here, too! I think you’ll love these, and of course you can sub in whatever goodies you like for what I used in mine. Enjoy, Oana! Definitely going to try these for a yummy back-to-school snack. And Pacari Chocolates are Kosher Pareve! Can you see my happy dance? Hi, Leah! I’m so happy you’re going to try them! And I hear you’ve been making tons of the coconut avocado ice cream. So glad you are enjoying it!